Another day at the Allt Duine Inquiry in Aviemore. This time though I was more than an observer as I was giving evidence, which is to say, reading my precognition, as it's strangely called, which had already been submitted to the inquiry to add to the massive pile of documents, before being cross-examined by counsel for the developers, RWE, and the representative for Kincraig Community Council, who support them. As my evidence is personal and subjective there wasn't much for them to question - mainly numbers of those who go there. I spent as much time commenting on the location of the photographs of mine such as the above, which were submitted by the Mountaineering Council of Scotland as part of their evidence. Ron Payne, the MCofS representative, gave evidence immediately before me. Finally the Reporter asked for information on a number of points, including the nature of the TGO Challenge. I then went back to being the audience, with one diversion to give a quick interview and have my photo taken for tomorrow's Press and Journal newspaper. The section of the inquiry on landscape and visual impact is now complete. Still to come are policy, wildlife (mainly eagles, I think), tourism and recreation. This should all be completed by the end of next week. Then we wait for the Reporter to give her decision. Below is the evidence I presented. I am a writer and photographer on outdoor activities, especially hillwalking and wild camping. 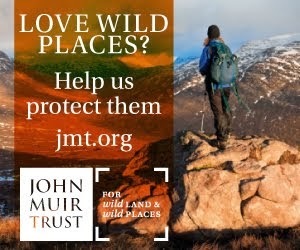 I am very concerned with the conservation and restoration of the diminishing amount of wild areas in Scotland. Before the Cairngorms National Park was established I served on the Cairngorm Partnership’s Recreation Forum on behalf of the Mountaineering Council of Scotland. I then served on the MCofS’s Access and Recreation Committee for many years and I am now on its successor, the Landscape and Access Advisory Group. I served as the President of the MCoS from 2008-2011. I have written extensively about the Scottish hills in magazine articles and books. 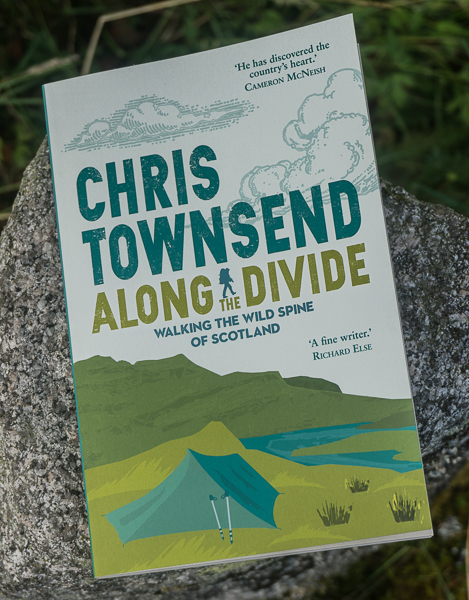 I am the author of World Mountain Series: Scotland, a detailed look at the Scottish hills; The Munros and Tops, an account of a summer long walk over all these hills; and A Year In The Life Of The Cairngorms, a pictorial record of the area. I walk and camp in the Cairngorms and the Monadh Liath regularly, and have lived in Strathspey for the last 23 years. It is this background of knowledge and experience that I bring to my evidence. For the last year I have been the spokesperson for Save the Monadhliath Mountains and have given many media interviews on behalf of this group. I have also visited the Allt Duine application site many times in the last year, camping in the hills and climbing the summits. For this Inquiry I have agreed to be a witness on behalf of Pitmain and Glenfeshie Estates. In giving this evidence I make no pretence at trying to carry out any technical assessment of the landscape and visual impact of the proposed wind farm development. Rather, I will simply speak to my own views, based on the above general and site specific experience, of the special qualities of the Allt Duine site and the mountains that surround it. The application site lies in the heart of the Monadh Liath mountains, between the two Corbetts (summits between 2,500 and 3,000 feet/962 and 914.4 metres) of Carn an Fhreiceadain and Geal-charn Mor. Not far to the west lie higher Monadh Liath mountains, the Munros Carn Sgulain and A’Chailleach, while to the south and east are the Northern Cairngorms with the Munros Sgor Gaoith, Braeriach and Cairn Gorm. The application site is clearly visible from all these hills - not just the summits but also the connecting ridges and some of the lower slopes. Should this application be approved and built those climbing these hills – and they are all important to hill walkers – will be faced with a view that will include the massive turbines instead of one of more hills and mountains. 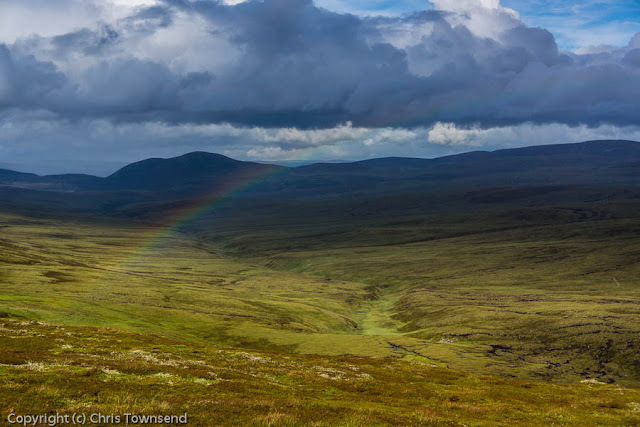 The Monadh Liath is a subtle landscape of curving gentle slopes, vast sweeps of moorland, lonely pools and trickling burns; a spreading, quietly beautiful, complex tangle of water and hill, heather and grass, land and sky. A natural place, home to birds, animals and plants and with a wonderful feel of quietness and peace. The attraction is in the wildness and remoteness, the sense of space and freedom rather than dramatic peaks or spectacular rock scenery. Here hill walkers can feel part of a wild natural world with little or no sign of humanity. The area is vast and you can walk all day without descending to roads or villages and then camp under the stars with just the moors and hills spreading all around. Yet, this mountain area is also easily accessible. The application site is usually approached on tracks and paths from Strathspey that climb up through attractive pine and birch woodland. These tracks will be turned into wider roads for the wind farm if it is built and the quiet forest beauty of this approach will be lost. The tracks lead to the watershed between the rivers Spey and Dulnain which is also the boundary of the Cairngorms National Park. From here the view is of rolling moorland hills spreading into the distance. If the wind farm is built this view will change to one of a mass of huge turbines in the immediate foreground and the wonderful sense of the vastness of nature will be lost. There will be no more peace, no more quiet. The sounds will no longer be those of wind and water and the calls of moorland birds. Instead the view will be filled with metal structures towering into the sky and the scars of the bulldozed roads built to service them and the main sound will be the whirring of the turbines. Currently there is a good walk along the watershed between Carn an Fhreiceadain and Geal-charn Mor. If you, Madam Reporter, have not already undertaken that walk I would urge you to do so. With the presence of 31 turbines the whole beauty of that walk would be changed utterly. At present it is a lovely and slightly challenging walk across moorland hills with nothing manmade in sight other than a few tracks that are crossed. If the wind farm is built people in the future will not be able to gain the pleasure I and others now gain from this land. Please walk this route in its current condition to appreciate what I am saying. The application area can also be approached from the west, over the Monadh Liath Munros, and from the north over another Corbett, Carn na Saobhaidhe, and the River Dulnain. This is a popular route for backpackers, especially on the annual TGO Challenge cross Scotland event in May, who cross the Monadh Liath from Fort Augustus or Loch Ness, camping en route. If the wind farm is built the turbines will be in view for much of this walk, destroying its core attractiveness in my view. The Allt Duine itself, by which I’ve camped, is an attractive moorland stream running through steep banks of heather and blaeberry, with occasional little rock outcrops. The view is of distant, flat-topped hills and a huge spreading sky. Again this would be lost if turbines dominated the landscape. For hill walkers this is a special place. The Monadh Liath is still one of the largest roadless areas in Scotland. Here you can relax in nature, away from the stresses and strains of modern society. The construction of wind turbines in this area would destroy this key perceptive quality of this landscape. One of the main reasons for walking in the Scottish hills is to experience the natural beauty and vastness of the mountains. Any human artefact is an intrusion into this and the bigger it is, the more of an intrusion it is. Wind turbines are very noticeable and visually very intrusive in such a mountain landscape. Seeing a mass of them breaking the skyline destroys the sense of wildness and the closer they are the greater the effect. Turbines in the Allt Duine area would be very visible from the popular Northern Cairngorm hills, impacting on the view across Strathspey, and so they would affect walkers and mountaineers in the National Park as well as those who visit the application site and the hills immediately around it. To sum up: the Allt Duine is a precious and remote area, yet also accessible and popular, where walkers go to experience nature and the sense of wildness away from roads and towns and society. Wind turbines here would destroy this sense of wildness that is absolutely key to the quality of this landscape for mountaineers, walkers and campers. Also, because the turbines would stand out in views from neighbouring hills, including the Northern Cairngorms, they would impinge on walkers and mountaineers in those areas too. Chris that's a well written precognition - your views are as important as any 'technical' data. Thanks for taking the bull by the horns and saying what probably thousands of hill walker a think.I do hope Madam reporter takes that walk. Well put together, from the heart and straight to the point. I think it is vital that those who make decisions on such precious places are brough there to experience what they may remove from our country for ever. Wonderful piece Chris - thanks for putting your view so well! A well written piece putting across a view shared by many hillwalkers. The planning process and Scottish Government "policy" is wrong to even consider the placing of such towering monstrosities within our wild lands. It couldn't have been expressed in plainer terms: this is what we have and what we stand to lose. Fingers crossed for common sense in this instance. Not everyone who lives in Kincraig agrees with the community council on this. Their spokesperson assumes that none of us walks in these, our local hills. I attended the public meeting a while back - it was dominated by the local lairds, who stand to gain, of course, and their employees and tenants who are being promised the earth - literally, I fear. Chris - an excellent contribution, and let's hope good sense prevails. "Improving the natural environment and the sustainable use and enjoyment of it is one of the Government's national outcomes." - Scottish Planning Policy, para 125. I have never understood how this (or indeed any) wind farm supports this outcome. 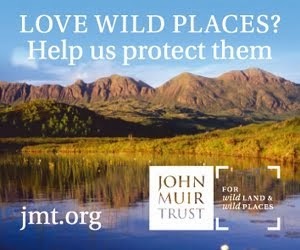 And quite how John Muir would be thinking if he were alive today - "Do something for wildness and make the mountains glad". Is this how? Your submission to the Inquiry was a well constructed piece that most, if not all hillwalkers would support. A concern that I have is that by pushing for our insular self interests, are we not a 21st century equivalent of Col. Whitbread and his ilk from last century, who defended their rights for their insular self interests? Another concern is that the Allt Duine landscape is a cultural landscape, not a natural one as it has been influenced by mankind over the past few centuries. So should we be arguing for the status quo, or should we be arguing for a restitution of the land to a natural landscape, with obvious impact on hill walking freedom? As a final point, what weight do you think should be given to the views of the local community, a majority of whom are in favour of the development, compared with those of non-local bodies? Normally with controversial developments, it is the locals who say "not in my backyard", but in this case it is non-locals who are saying that. Should the views of those who live with the development day in, day out, be given equal or different importance compared to those who would visit the location on an ad hoc basis, largely for leisure pursuits? I don't think we are equivalent to Col Whitbread because I don't think ours are insular self interests but rather the opposite. The landscape and nature are crucial to everybody. Whitbread wanted to keep everyone out and just use the land for stalking. The Scottish landscape is a national asset of great importance. I am in favour of restoring landscapes (or preferably allowing them to recover), as I have written elsewhere. I don't think this would have any impacts on hillwalking freedom. Whilst it has been affected by mankind the Allt Duine area is still relatively natural compared with towns, roads, industry. It would be far, far less natural with a wind farm. It's debatable just how many of the local community do support the wind farm. Also, the Cairngorms is a national park not a local one. And what constitutes "local"? I live in Strathspey as do many other objectors to the wind farm including the local councillor who was one of the main people arguing against the scheme when Highland Council, who represent local people, rejected it. I can't think of any grounds on which this wind farm could be justified. Thanks for the response to my concerns. My analogy with the landowners should perhaps have avoided the name of one of the most infamous (to hillwalkers) as this has maybe polarised the comparison, but nevertheless, both interest groups are/were pursuing a policy that was appropriate to them in terms of how the landscape was to be utilised. I think you said in your opening paragraph that the Kincraig Community Council voted in favour of the development, which is where I took my reference to "local" from. I have no firm views on this development. I have quickly become used to such developments in my local hillwalking areas and they do not detract from my enjoyment of trips into them. Much in the same way that the hydro dams and flooded glens are now taken for granted, from a visual perspective. I wish you luck with your campaign. Thanks. Kincraig Community Council did vote in favour of the development, just, but many people in Kincraig were against or said they hadn't made up there mind. Also Kincraig is one small village. I think the local community is much bigger than that. The hydro dams and flooded glens are taken for granted by some people now, though I always find them, especially Mullardoc, rather sad places. I also think the dams are far less intrusive than wind turbines. Of course back when they were being built there was opposition and campaigns that prevented places like Glen Nevis being dammed. Much more recently a success for conservation was the campaign against dams in the area north of Torridon.